Every home should be so lucky to have a well loved rocking chair. Our glider rocker had gone beyond well loved and moved into the realm of ugly. 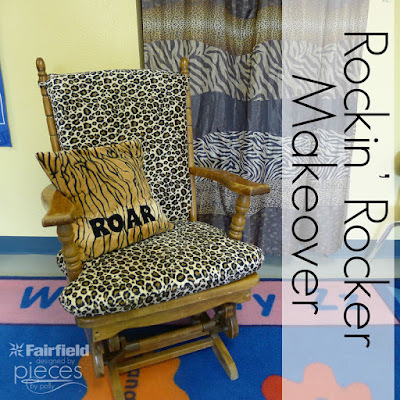 So when a friend asked me for help recovering the glider rocker for her special-ed classroom, I decided both of our chairs needed an update. Fairfield generously donated the foam and Shield Moisture Barrier for the classroom rocker and Shannon Fabrics donated the Jaguar Cuddle® Fabric and I purchased the Embossed Ribbon Cuddle® in Brown for my own chair update. 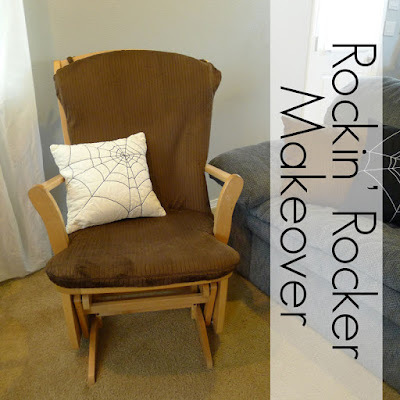 It was surprisingly easy to re-upholster the two chairs and you can do a chair in a single afternoon easily with just some basic sewing experience. My friend is a special-ed teacher in a life skills classroom where the kids have a lot of needs...and sometimes have accidents...and she didn't really have a good way to wash the foam in the chair. We definitely needed to replace the foam, and make some covers with a moisture resistant barrier to save the new foam from the same fate. A moisture barrier is always a good idea in a household with children. We didn't use a moisture barrier on the backing since it's less likely to receive spills or accidents. We opted to use super soft cuddle fabric for it's softness and durability. You're could also choose upholstery fabric or something like duck canvas. If you've worn our your original cover, chances are the new cover will be getting a lot of wear too, so you need to choose a thicker, more durable fabric that your typical quilting cottons. 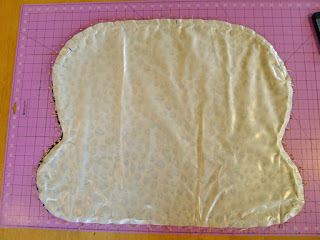 All of these come 60" wide or wider, so the tutorial is written assuming you'll be using 60" wide fabric. Here's what you'll need to recover your own glider rocker. Approximately 2 yards 60" wide cuddle, upholstery, or 60" wide thick durable fabric. 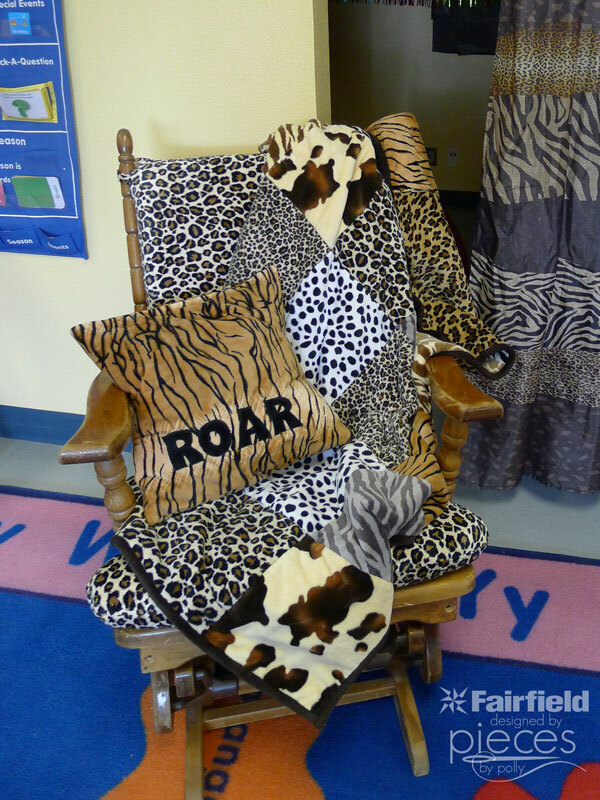 We used Jaguar Cuddle® Fabric and Embossed Ribbon Cuddle® in Brown (Your rocker might be different. You need depth of your seat cushion, plus the height of your back cushion, plus 8-10 inches to account for the thickness of the foam and some extra. It's also a great idea to purchase enough extra to make a couple throw pillows. 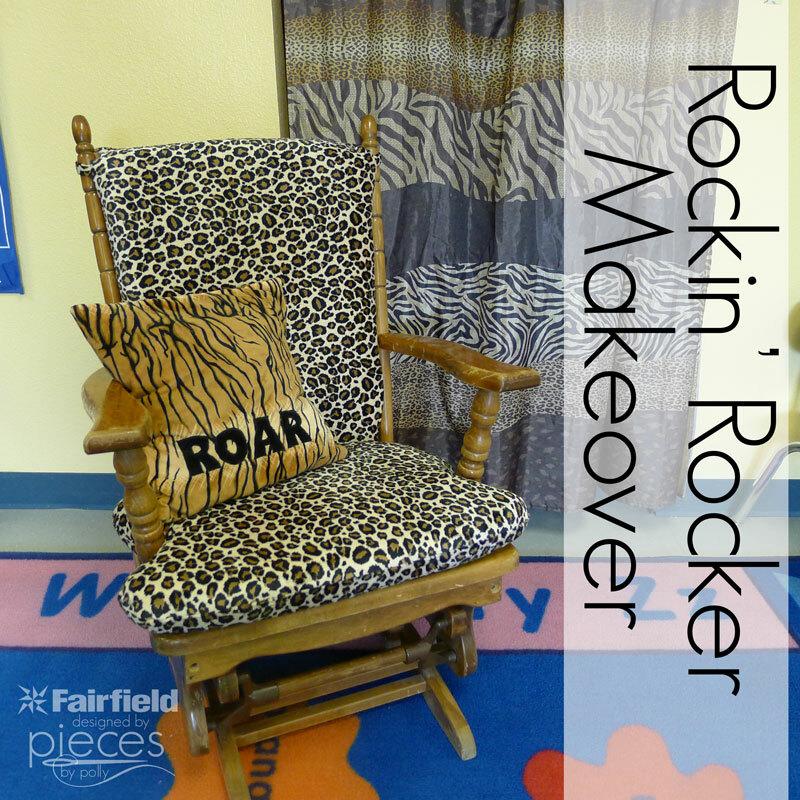 It's an instant way to help your new rocker coordinate with the rest of your decor. 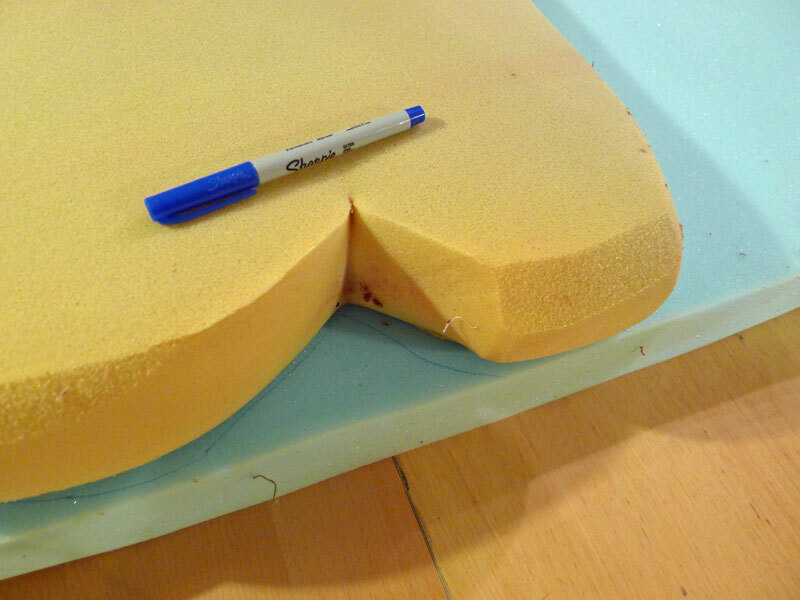 1 Piece of Cushion Foam - Soft Support Foam 24″ X 24″ X 3″ Thick if you're replacing the seat cushion. Elective Carving knife or sharp bread knife. 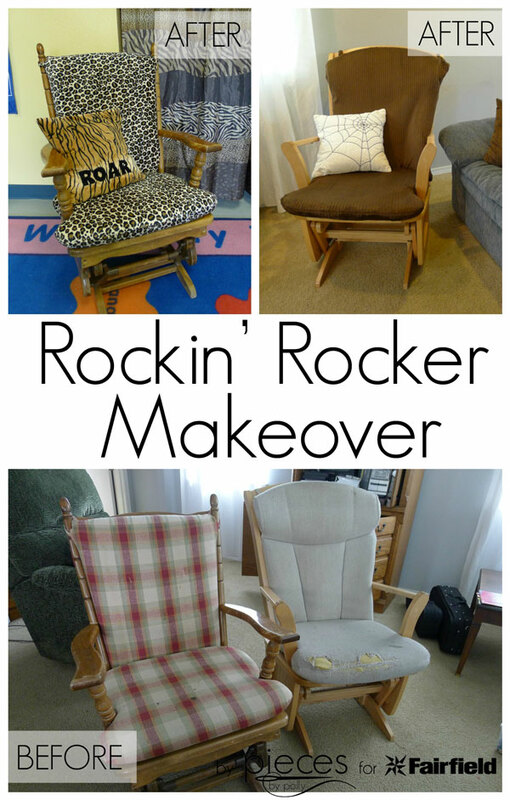 Each rocker will be slightly different, but generally they're pretty similar. Remove your seat cover from it's form. 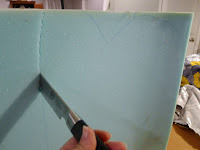 If you're replacing the foam, you'll use your old foam as your pattern. Trace with a sharpie. If you have an electric carving knife, that works best for cutting foam. I don't have one, but my bread knife did the job. Set the foam aside. Now we're going to layer our fabrics. If you're adding the Shield Liner Fabric as a moisture barrier, then you'll start with shield on the bottom. Then you'll want your cuddle fabric folded in half down the middle with the soft side TOGETHER, and lay that on top of your shield liner. 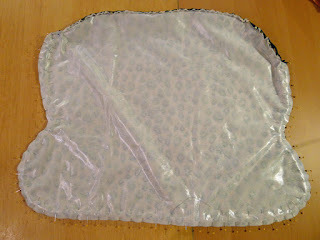 Than put another piece of shield liner on top., then your fabric face UP. 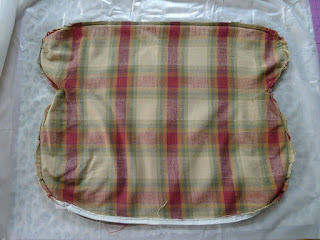 Turn your old seat cover inside out and lay it over your layered fabrics. 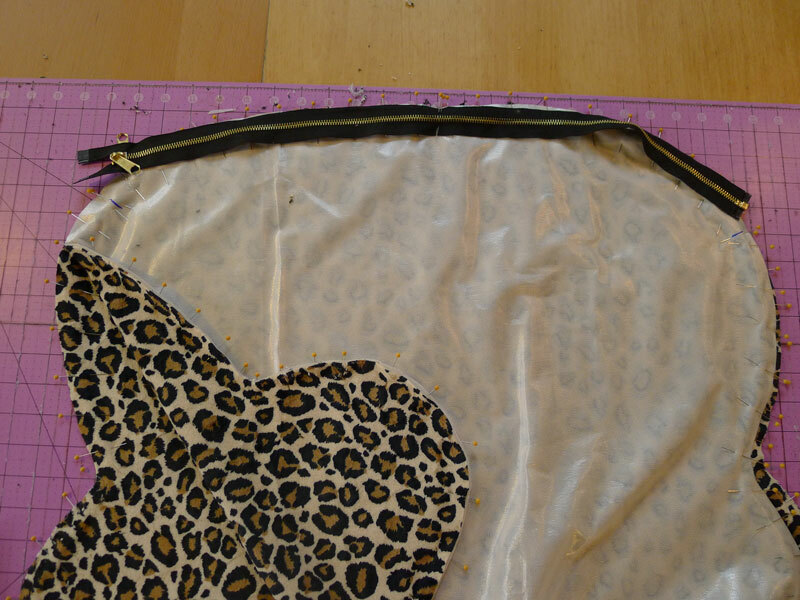 Use a good pair of sewing scissors or your rotary cutter to cut out around your original seat cover. 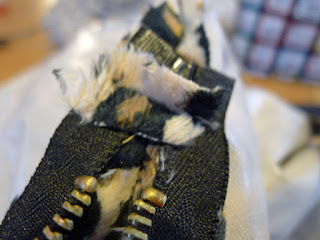 You want to cut 1/2 inch from the old stitching to give yourself some seam allowance. Carefully remove the old seat cover and the extra fabric. 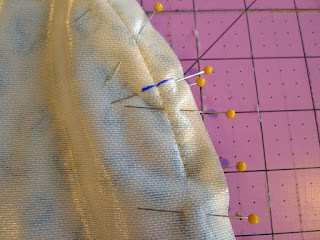 Pin through all four layers along the BACK of your cushion where your zipper is going to go. 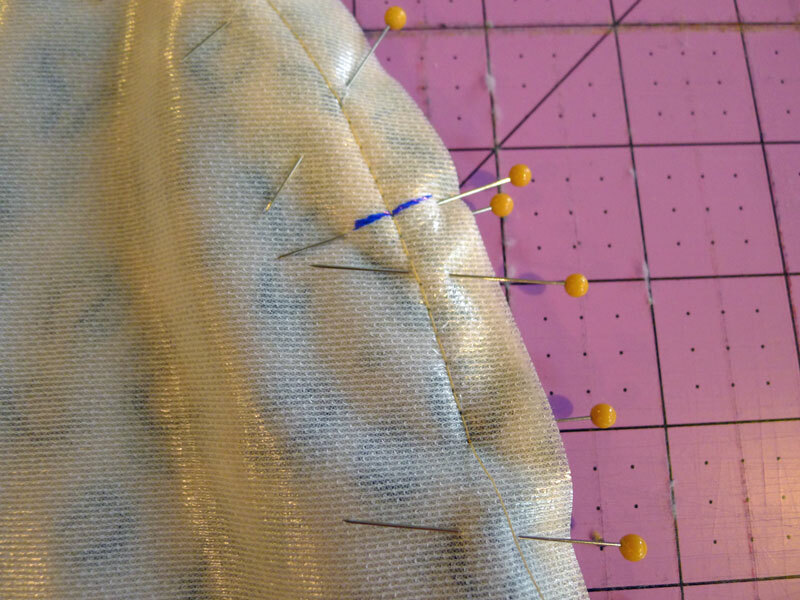 Because cuddle fabric is so slippery, we also want to pin around the rest of fabric, but you'll pin the layers separately. 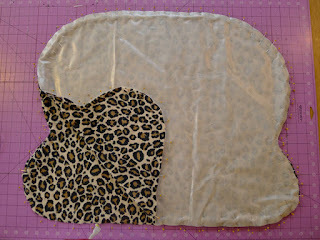 Pin the top two layers together, and the bottom two layers together. With the stitch length on your machine set to the longest stitch length available, we're going to baste stitch the back of your cover closed, just the length of your zipper plus about 1 1/2 inches on each end. 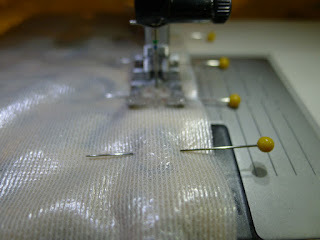 Remove the pins from the area you baste-stitched and open up your cover. 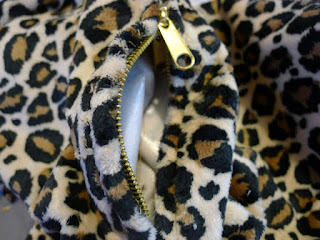 Pin your zipper along the seam. 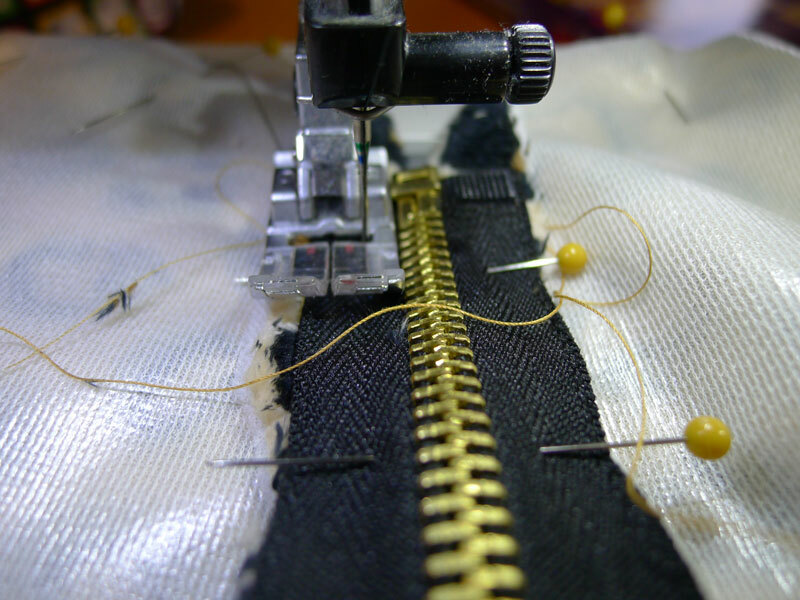 Using a regular stitch length sew in your zipper. Use a seam ripper to remove your basting stitches and open your zipper slightly. Pin all four layers together around the rest of your cushion cover. 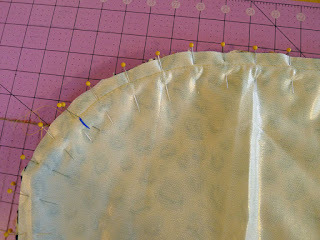 Stitch around the rest of your cushion using a 1/2 inch seam allowance. Because I was worried about the ends of the zipper being stressed by pushing the foam in, I used a small scrap of fabric and sewed it to the ends to provide extra stability. 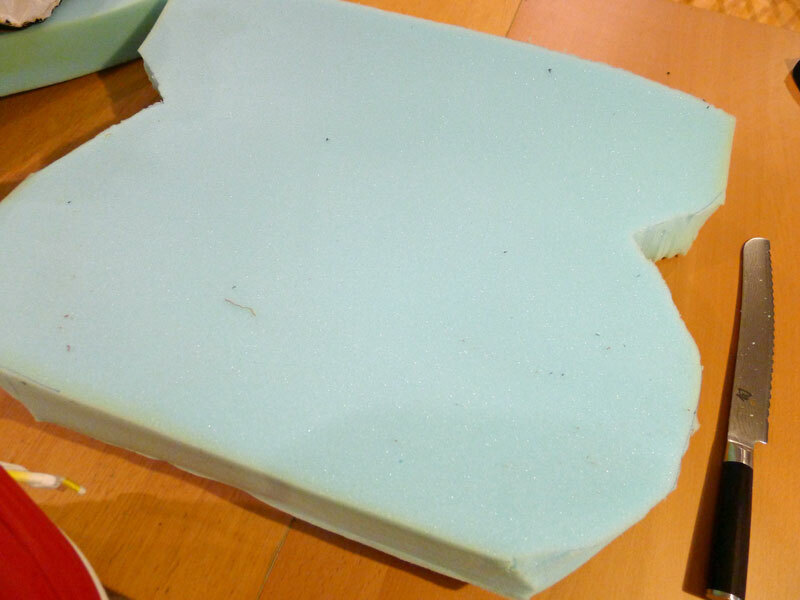 And you're ready to add your cover to your new foam...and throw the old nasty one away. You'll want to trim and clip curves BUT try your cushion on INSIDE OUT first to check and make sure that the first is snug, but not too tight. 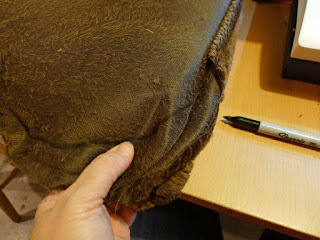 Snug/tight covers look the best...but you also need to make sure you can get your cushion in. 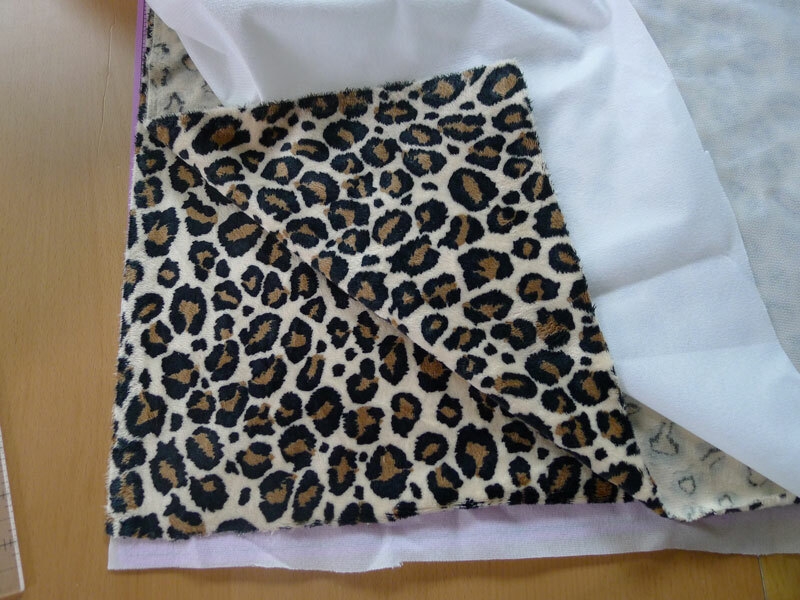 The backing cushion cover is going to be really similar. In both of the chairs I worked with, there was no way to remove the old cover to use as a pattern because it was attached to the foam with sewn buttons or by stitching. 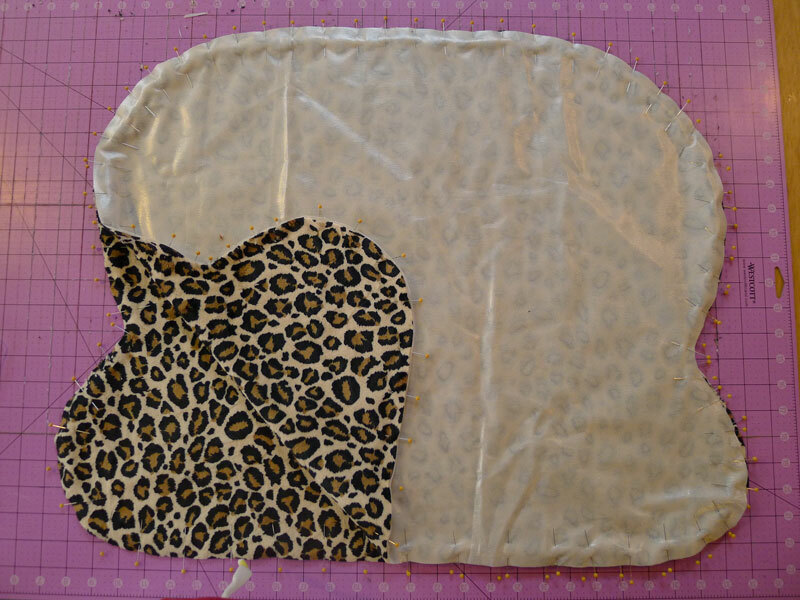 Instead, I used the whole piece of covered foam as the pattern and did it the same way EXCEPT, you want to give yourself an extra inch to inch and a half (instead of the 1/2 inch we did on the cushion all the way around to account for the thickness of the foam when you cut it out. 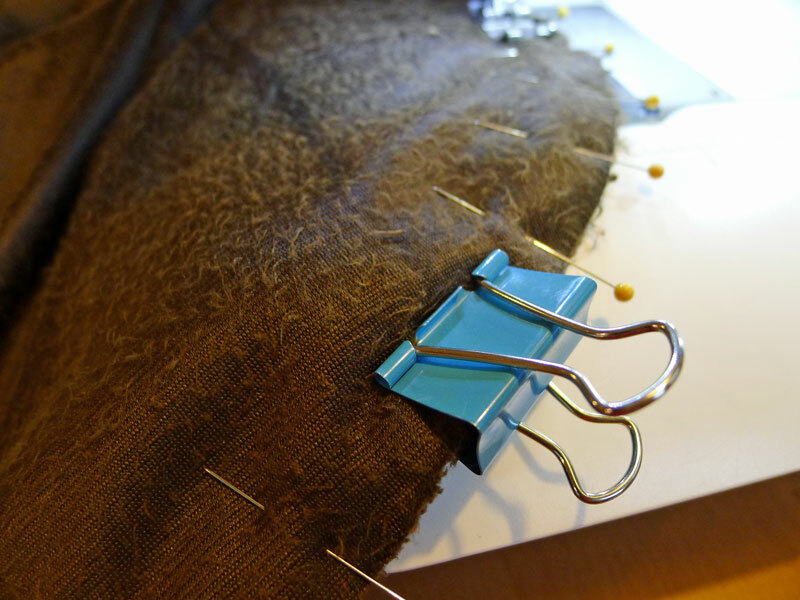 Depending on the design of your chair, you may need to add loops or ties in the top seam of your back piece. 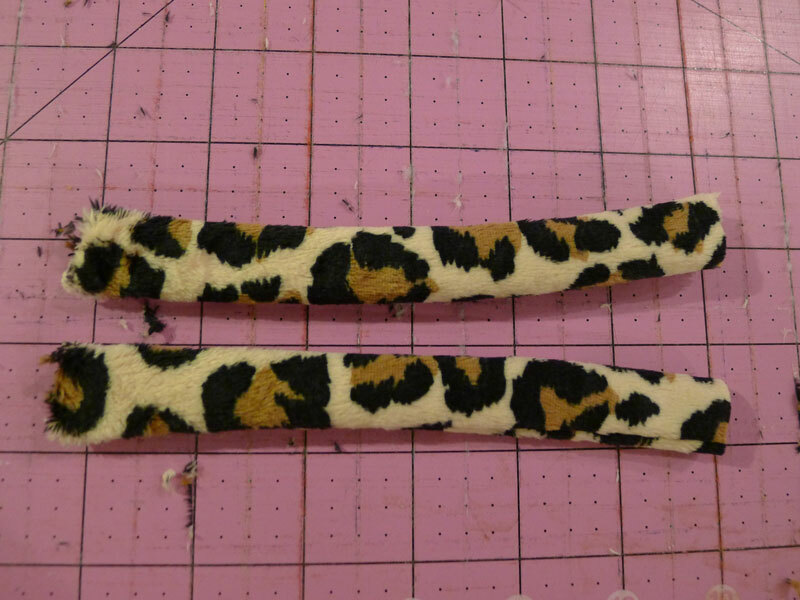 The animal print chair needed loops. Mine needed ties. 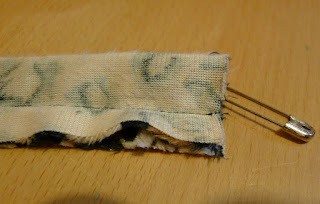 From your scraps cut strips about 3 inches wide and the length your loops or ties need to be (length of the old ones plus 1 inch for sewing into the cover). 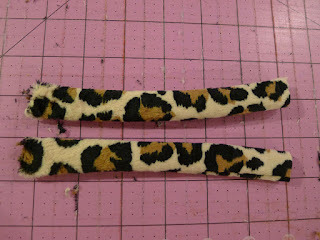 Fold them in half an stitch with a 1/2 inch seam allowance. Use a safety pin to turn right side out. Use your old cover as a guide for where to add the loops/ties. 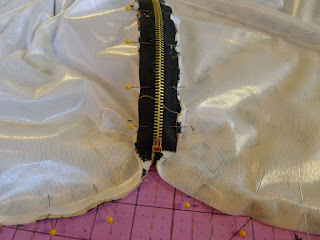 You should pin these into the seam allowances after you've added your zipper but BEFORE you sew the rest of your cover closed. 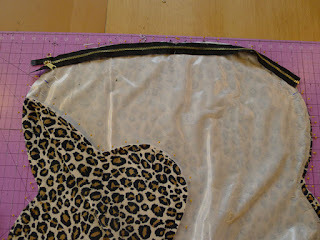 For the animal print back with the loops, I was able to use pins to hold it in place while sewing because the ends entered the cover at different places. However, in the case of the brown rocking chair, the two ties had to be attached at the same point. This made the area was so thick, that I used a binder clip. You may find when working on either cushion that you have some loose spots. The best way to fix this is to have your new cover INSIDE OUT and insert the foam. 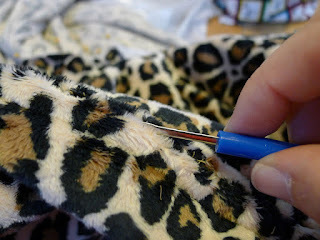 Then use your hands to pinch the fabric together so that it's more fitted and mark the line with a sharpie. Then stitch over this line and try it on your cushion INSIDE out again before trimming. For the old back covers that couldn't be removed, I just left them on underneath the new ones. Who's to know? Once I finished it up, I just wondered why it had taken me so long! They looked so much better. 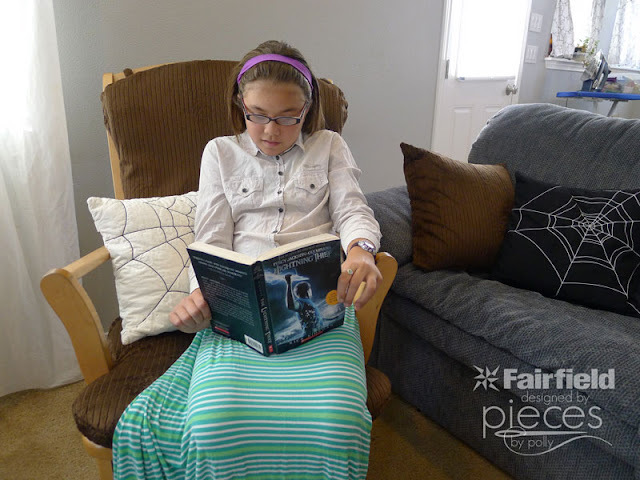 And the kids LOVE the snuggly softness of it. Get the tutorial for the Spider Web pillows here. Fairfield products can be found at most sewing and craft stores or ordered directly from their website. Shannon Fabrics cuddle fabrics can be found at many local quilt shops and fabric stores, and online at fabric.com,theminkyboutique.com, and fabricdepot.com. You can also view their NEW Store Locator to find shops near you:Store Locator.